Avery has been shunned by the art world, but she has come to a showing because her friend Skyler is featured in one of the pictures by a local artist. When Skyler doesn't show up Avery becomes very worried. What is more concerning is that the picture of Skyler is a death pose and the artist is furious because it isn't his! Who took the photograph and replaced the original with it, and is her friend really dead? Parker is on the job helping Avery find out what happened to Skyler. Avery and Parker are attracted to each other, but neither knows what to do about that attraction. Both have a past that is keeping them from being able to commit to each other. Will they be able to work together to find Skyler and still maintain their distance? 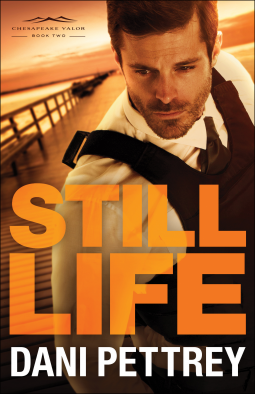 There were so many things that I enjoyed about Still Life! I loved the characters of Avery and Parker even though I did get frustrated with their circling around the same issues again and again. I loved the spiritual message throughout the story of forgiveness and moving on with ones life. Getting a glimpse of what is going on with Griffin and Finley's lives was fun and we were teased with further sightings of Luke, the friend who supposedly died 7 years ago, but that Kate has never given up hope that he is still alive. Still Life had it's moments of suspense and catching a glimpse now and then into the thoughts of a stalker kept the suspense alive. I'm definitely looking forward to the next installment of the Chesapeake Valor series which will feature Tanner and Declan and hopefully more sightings of Luke!